Benidorm is not well known for the gay scene but does in fact have a vibrant gay village often overlooked as a gay tourist resort. There are currently 22 bars some of which have been trading for over 30 years. 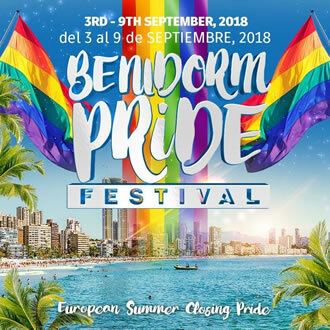 The gay village is situated in the Old Town of Benidorm and as such is very compact with all the venues within two minutes of each other. You will not find the "label" attitude often found in more well known Spanish gay resorts like Sitges and Gran Canaria and will therefore find a more down to earth and comfortable visitor who know how to enjoy themselves. The bars (and they are bars not clubs) are mostly small with some having dance areas. All tastes are catered for well from the young and trendy crowd to the more mature visitor. The scene is very late getting busy from around midnight with most venues closing at 4.30am. Peak season for the gay scene is from September to December and April to June. July and August tend to be quiet as prices for flights and hotels are higher. Benidorm has changed a lot since the the days when it was an exclusively British 18/30s club land. Sure it still has a great club scene and plenty of young people come to fill the clubs, and it continues to attract many Brits, but over the years it has become far more international. It is also becoming a more stylish town, catering to a wider variety of people. You'll still find lots of fish 'n' chips, if that's what you've come to Spain to eat, but you'll also find a lot of fine dining. The gay scene is well established, with many bars appealing to different tastes. Add to that its beautiful beaches, over 2,000 shops and lots of major attractions to keep you occupied, it all adds up to a first rate gay holiday destination. Interestingly, after New York, it's often claimed that Benidorm has the most sky scrapers in the world! Over 330 buildings taller than 35 meters, yet surprisingly, its not the urban sprawl you may expect. Everything is very spaced out with wide streets and lots of room to breathe. This resort is so well-known as a rather brash Spanish holiday resort city on the Costa Blanca. It has a fabulous sunshine record, even during the winter months - and it has beautiful sandy beaches and spectacular backdrop mountain scenery 'behind' the resort itself. The busy gay nightlife scene is to be found in the tightly packed little streets of the Old Town, where, close-by, we have a wide choice of hotels and apartments - mostly close to the Poniente Beach - which we prefer to the brash naffness of the Levante beach especially towards the (ugh!) Rincon de Loix area where the straight, cheap, British package-holidaymakers are put! Much cheaper accommodation is, admittedly, by the Levante beach - and groups sharing a two- or three-bedroomed apartment can get a very good deal if you can live with the location and a short taxi-ride, so we offer you that, too! 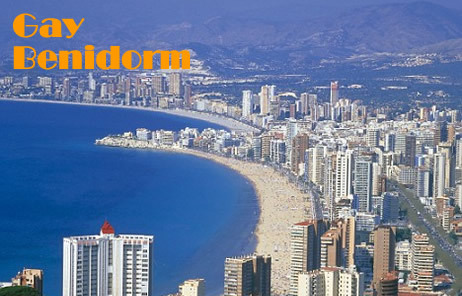 (If you book late, it may be all that there is left, anyway because Benidorm is very busy and popular!). Our favourite gay and gay-friendly hotels and apartments are located right in the heart of the gay district of the Old Town, or very close-by but normally it is necessary to plan well ahead to stand a chance of us having availability, due to their popularity. There is also a well-appointed gay complex out-of-town but, again normally, you need to book a long way in advance for this. For a nice contrast, we can offer you private self-catering apartment accommodation in the up-market little gay-friendly coastal town of ALTEA -which is just a few miles out of BENIDORM (just 10-minutes in your hired car or taxi, but with a good train and bus service) ...with gay-nudist beaches close-by and an excellent choice of restaurants in its very pretty Old Town area, with roof-terrace dining for spectacular views of the backdrop mountains and the sea. This option would suit a couple, or two couples sharing, who would like to combine a less frenetic holiday, staying in an up-market Spanish town, enjoying fine local food and wines - with the flexibility to travel along the beautifully scenic coast towards Denia and Calpe (not forgetting those gay beaches!) 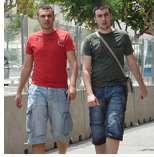 - with as much, or as little, of the gay nightlife of Benidorm Old Town as you may want. Now, who said a holiday based around BENIDORM is tacky? Longer stays are also possible in ALTEA.